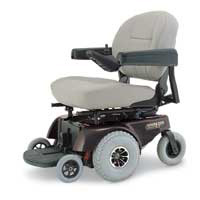 The Jazzy® 1113 ATS offers you everything you need -- all of the big chair options and accessories, even full rehab capabilities -- on the most compact frame available. You'll take on tight spaces and narrow hallways without sacrificing a strong outdoor performance never before seen in a chair of this size. For sharp ramp transitions as well as a smooth and stable ride even over exceptionally rough and uneven terrain, the Jazzy 1113 ATS is equipped with Active-Trac® Suspension. As an added plus, both the Jazzy 1113 ATS fully disassembles for transport.